Every so often, a cultural touchstone descends on college campuses, with the effect of putting campus discourse under the microscope for all to see. The results, frequently, are discouraging. Clint Eastwood’s blockbuster film American Sniper, adapted from deceased Navy sniper Chris Kyle’s memoir, is the latest exhibit. That American Sniper is a controversial movie is not a controversial observation. It was one of the most remarked-upon movies of last year, and the fevered debate over its portrayals of the war in Iraq, of the Iraqi people (and, by extension, Arabs and the Arab world), and of Kyle himself was difficult to miss. It’s that second concern—the movie’s portrayal of the Arab world—that has proven particularly controversial in recent weeks, and has left several universities flailing in the face of criticism of American Sniper’s allegedly anti-Arab viewpoint. Given that universities are supposed to be, as the Supreme Court has said, “peculiarly the ‘marketplace of ideas,’” recent press suggests that they have been falling down on the job. This has played out perhaps most embarrassingly at the University of Michigan. American Sniper was scheduled to play there on April 10 as part of UM’s “UMix” series of late-night campus events. 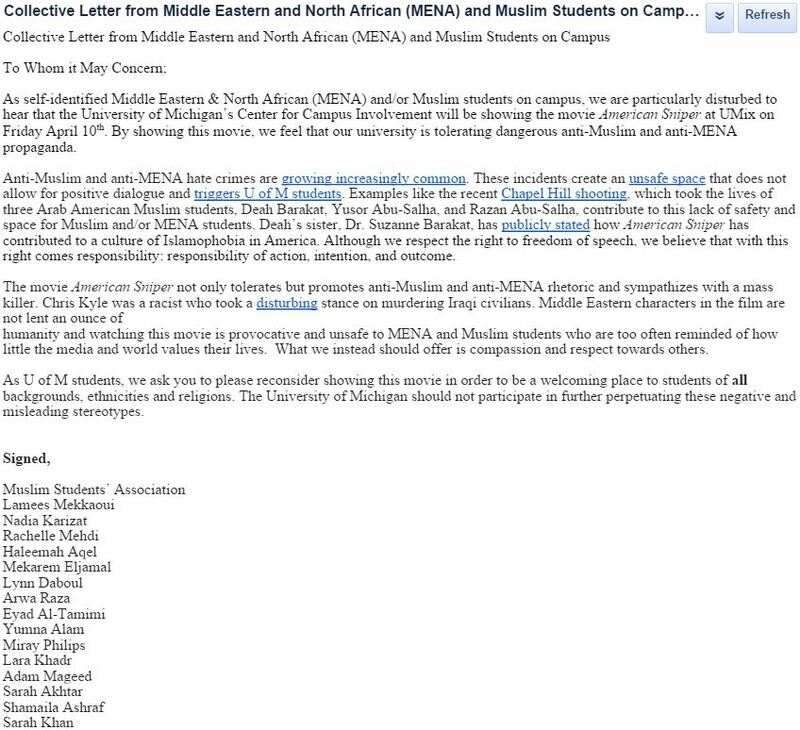 This changed after a student petition against the screening gathered more than 300 signatures, claiming the movie “not only tolerates but promotes anti-Muslim and anti-MENA [Middle East and North Africa] rhetoric” and that it was “provocative and unsafe to MENA and Muslim students who are too often reminded of how little the media and world values their lives.” On April 7, UM’s Center for Campus Involvement announced it was pulling the movie, apologizing for “causing harm to members of our community” and further stating: “While our intent was to show a film, the impact of the content was harmful, and made students feel unsafe and unwelcome at our program.” The American Sniper screening would be replaced, they informed people, with a showing of Paddington. Though the screening that the protesters interrupted continued, a later screening was postponed, and it appears unclear when, or if, it will be rescheduled. If “American Sniper” isn’t an appropriate movie to screen as entertainment for a diverse group of college-aged students, the idea that a PG-rated movie about a sentient bear ought to be the standard seems an over-correction in the opposite direction. “American Sniper” might offend some students’ sensibilities, but suggesting “Paddington” as age-appropriate entertainment for college students carries its own whiff of condescension about students’ capacities to be entertained and riled up all at the same time. And while it’s good that screenings of American Sniper are back on the table, we shouldn’t feel good about the sense that such occasions need to be stage-managed and curated for the maximum possible hand-holding of students. The idea that violent and difficult films like American Sniper can be shown to college students only in controlled environments presumes that students are owed an apology or consolation should they have to encounter anything emotionally difficult. If college students aren’t insulted by this, they should be. This “problem of comfort” isn’t just detrimental to student development. It’s also utterly destructive to free speech and academic freedom, chilling those who might be inclined to express controversial opinions or explore controversial disciplines, either for fear of being investigated and punished or because they just don’t want to put up with what they see as unnecessary hassle. As Nick Gillespie worries, “At a certain point, these predictable and preventable cycles wear down even the most stalwart of defenders of open discourse and expression, giving way to exhaustion.” This damaging way of thinking has ramifications inside and outside the classroom. It’s why many tenured professors rightly fear they will face punishment or worse for their choice of course materials. It’s why comedians like Chris Rock have stopped performing at colleges. And it’s why, when the next American Sniper-type controversy comes to campus, students may not be equipped to handle it any better than the current one.